Note: Some familiarity with the Borges work is required to make any sense of this story. Knowledge of what a Turing Machine is will help too. 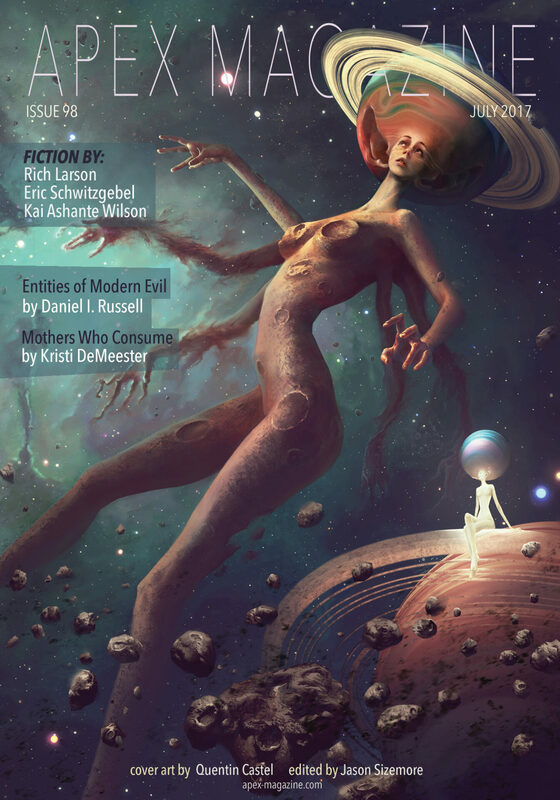 "The Turing Machines of Babel," by Eric Schwitzgebel [bio] (edited by Jason Sizemore), appeared in Apex Magazine issue 98, published on July 4, 2017. Pro: The rabbits are Turing machines, and the books are the “tapes.” Whereas Borges’s original story showed that all information amounts to no information, this story adds the rabbits to show that all programmed action amounts to no action. It escapes from the hopelessness of the original by having Dulcinea (the name of Don Quixote’s girlfriend) hack the programs and make the rabbits useful to people. Early in the story, Hamete meets people who kill his rabbit and who are obsessed with a depressing line of text that says “And the sun descend.” The hopeful conclusion (disguised in apparent nonsense at the very end) answers this with “No, says Dulcinea. We will become God’s fingers and lift the sun.” One might interpret that various ways, but an easy one would be that the human mind itself is not an automaton. Con: It’s not a story. More like a puzzle that makes a statement. And it is way too dependent on readers having already read the Borges story. Glad I saw your note about The Library of Babel before reading this.